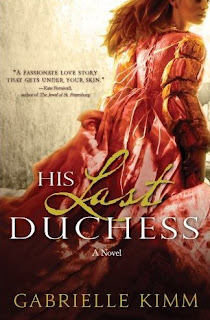 Passages to the Past is pleased to bring you a guest post from author Gabrielle Kimm, whose novel His Last Duchess, was released on October 1st by Sourcebooks! In addition, the kind people at Sourcebooks have sponsored a giveaway for a copy of His Last Duchess to one of my lucky followers! I often get asked, ‘Where do you get your ideas from?’ My answer is inevitably something along the lines of: ‘It’s not really that I get ideas … they tend to get me.’ For me it works like this: the idea doesn’t exist, and then it does, and then it’s there in my head, and I can’t imagine it ever not being there. That’s probably no help at all to aspiring writers – but it is the truth. It was certainly like that with the inspiration for ‘His Last Duchess’. One day I had no idea I was going to write a novel, and by the end of the next I had the whole plot structure, the cast of characters, the setting and the era clear in my head. It was a truly extraordinary day. Although His Last Duchess is a historical novel – it has at its heart the ill-fated marriage of the fifth duke of Ferrara, Alfonso d’Este, and Lucrezia de’ Medici and it takes place in Ferrara in the middle of the sixteenth century – it all actually began with Victorian poet, Robert Browning’s monologue, ‘My Last Duchess’, rather than with historical facts. I came across the characters as Browning’s creations, rather than long-dead, real-life aristocrats, and it was only when I had the idea for the novel, and started researching that I began to piece together the historical truth behind Browning’s fiction. The actual facts behind Browning’s poem are these: Alfonso d’Este (unnamed in the poem) married Lucrezia de’ Medici in 1559, and less than three years later the poor girl was dead, at the age of seventeen. Historical sources have mixed opinions as to what caused her death: some cite natural causes (tuberculosis, plague and anorexia being some suggestions), but far more historians believe that somebody had a hand in her demise. Most probably, her husband. Alfonso had for several years been under huge pressure to produce an heir, as the powers-that-be in the Vatican had declared that should he produce no legitimate issue, they would reclaim the titles and the lands, leaving the Este family with only the towns of Modena and Reggio in their portfolio. Alfonso would have been horribly aware that, if this were to happen and his rights to Ferrara removed, his extraordinary, hugely powerful, nine-hundred-year old dynasty would be utterly emasculated. In the end, of course, this is exactly what happened. Browning’s poem is narrated by the duke. He depicts him talking to the emissary from the father of his second wife-to-be, standing before a portrait of his last duchess – poor dead Lucrezia. He is highly articulate –clearly verbally dextrous, despite his protestations that he has no ‘skill in speech’ – and he seems charming and cultured. He is polite and pleasant to his guest. At the start of the poem, he uses words like ‘wonder’, ‘depth and passion’, and ‘earnest’ to describe his late wife; you get the feeling that he is treasuring her memory as much as he clearly treasures this painted image which is kept so carefully hidden behind a curtain. But then he begins listing the poor woman’s faults, one after another. By the time he has all but openly admitted that he ordered her death, his very courtesy seems menacing, and you can easily imagine the raised heartbeat and the wide-eyed wariness in his listener (who must surely be hoping that he will be allowed to return home safely, having been party to this alarming confession). 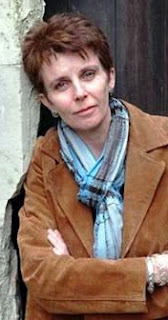 For a time I was worried that the character of the duchess, as portrayed by Browning, would not be sustainable across a whole novel. He describes her as having a heart ‘too soon made glad, too easily impressed.’ She liked ‘whate’er she looked on, and her looks went everywhere.’ This worried me. I wanted to stay true to Browning’s creation, as I was specifically planning this book to be the back story to his poem, rather than just to historical facts, and, if I were to remain faithful to the poet’s description, it seemed to me that the duchess would be either an indiscriminate, promiscuous little hussy, or a sort of simple-minded, love-everyone sweetie – a Renaissance Pollyanna, if you like. Neither of these alternatives appealed to me in the slightest. But then it occurred to me – in the small hours of one chilly morning - that the description of the duchess is not Browning’s. It’s the duke’s. And this description of her is being offered by the man who has just admitted to having had her permanently silenced. Did I believe him? Did I trust him? Not in the slightest! I began to feel that the duke’s view of his wife was fundamentally distorted, either deliberately, in order to blacken her reputation, or unwittingly because of some psychological flaw in his make-up. Discovering what ‘his last duchess’s real personality was like, and finding out exactly why the duke’s view of her is so inaccurate, has been what has entertained me so much in writing this novel. I do hope Mr Browning would have approved of what I’ve done with his characters! Thank you, Gabrielle, for stopping by with such a fabulous guest post! For more information, please visit Gabrielle Kimm's WEBSITE and BLOG. - Giveaway ends on October 28th. This sounds like a very interesting story.Don`t know anything of Lucrezia de Medeci. Thnx 4 the chance. This is so sad, a young impressionable girl longing for love only to be killed by her husband. Interesting that Gabrielle Kimm was inspired by Browning's poem to write the book. I would love to read 'His Last Duchess". + 5 I am a follower of Passages to the Past. + 3 I have joined Passages to the Past Facebook Page. What a pleasure to read this background to the famous poem, and to Gabrielle Kimm's thrilling-sounding novel. Thanks for the interview, Amy. How sad to think that a "child" of 14 or so is (probably) forced into a marriage and pressed to produce an heir then loses her life within a few short years. I am totally amazed, Gabrielle, that within a couple of days this plot and characters came to you which resulted in this fabulous sounding novel. I think I can manage just to mentally prepare a grocery list in this time period! (Forgive me, I was simply injecting a bit of humor there.) I certainly look forward to reading this book. Thank you for the enticing synopsis. Follower of PTTP, as well as on FB. I follow on gfc #4. I follow on gfc #5. I follow you on facebook #3. I love interviews about the backstory to writing a book. Thanks! This book sounds wonderful and would love to read it. I follow you here and on Facebook. Thanks for a great offer. Loved the post by Gabrielle Kimm. His Last Duchess will be added to my Wish List. Please enter my comment in your Giveaway. I'm a follower- thanks for the giveaway! I've had this one on my TBR list for months! I would love to win. This is on my list to read. This one sounds good! Always love hearing about new books here. Thanks for the giveaway! I'm really excited to read this book. I have been interested in the Medicis. I would love to win this book. What a terrific giveaway! I love reading about the Medicis!! Am a follower of the blog and on FB! This is already on my to-read list! Must win!!! I think this book sounds really interesting and I'd love to have the chance to read it! I've never read much about any of the d'Medicis; this book sounds fascinating. Thanks for the giveaway. Oh, this sounds fascinating! I'm looking forward to reading it. I really don't know much about the history of this time and place, so it will be fun to travel somewhere new! Thanks for the chance to win a copy! Can't wait to read "His Last Duchess," I love reading about the Medicis, especially Lucrezia. It's amazing the way Gabrielle's mind works when creating a novel. I love the idea of merging Browning's monologue with historical fiction. I bet it's awesome and I can't wait to read it. Wonderful "author" post! Ooohhh I HAVE to read this book! Thanlks so much for this fantastic giveaway! The Italian Renaissance period is on of my favorites. I'd love to win a copy of The Last Duchess. I'm a long time follower of this blog and on Passges to the Past FB page. I shared about this wonderful giveway on my facebook page. This would be a new area of historical fiction, as well as being introduced to a new author, for me. That would be delightful. This is a period I know little about but it sounds fascinating. I have had this book on my wish list ever since I saw it featured on Future Releases on Passages. I would love to win it - thank you for the giveaway. I do like this kind of book.. such intrigue ! !